Brigadier Phineas Bowles, an experienced soldier who had fought in the Protestant army of Queen Anne, was commissioned in 1715 to raise a regiment of dragoons to serve the Hanoverian King George I who was under threat from supporters of the Roman Catholic James Stuart (the First Jacobite Rebellion). Brigadier Bowles recruited primarily in Berkshire and the Home Counties. Six troops were raised (about 300 mounted men), with their headquarters at Reading. With the Roman Catholic insurgents in Scotland defeated, Bowles Dragoons crossed the Bristol Channel to Ireland in October 1718. General Bowles was transferred to 8th Dragoons in 1719 and the Colonelcy of the Regiment passed to his younger cousin, also named Phineas Bowles. 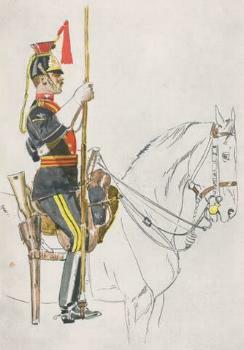 A list of regiments in Ireland dated 1749 shows the Regiment (numbered XII) as wearing uniforms of "red and white", although when the scarlet jackets were replaced by blue jackets (for light cavalry) the facings for the 12th light Dragoons were pale yellow. The Regiment was to remain in Ireland for the next seventy-five years. 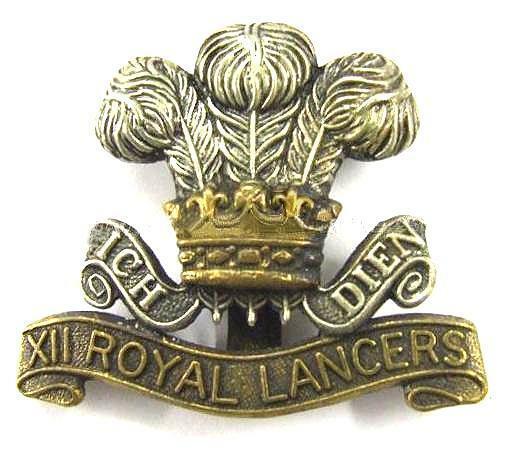 Re-organisation of the British Army in 1751 saw the Regiment given the title 12th Regiment of Dragoons, and further re-organisation in 1768 saw the name changed to 12th Prince of Wales's Regiment of (Light) Dragoon. 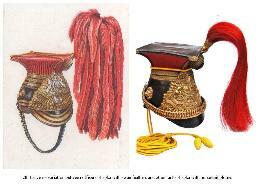 In 1784, 'light dragoon' uniforms were changed from scarlet to blue. 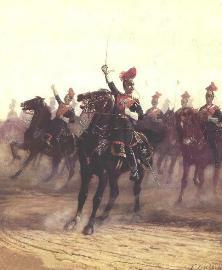 Arthur Wellesley, the future Duke of Wellington, served briefly with 12th Light Dragoons as a subaltern between 1789-91. Although employed with domestic peace-keeping duties, the Regiment did not experience a major campaign until 1797, when they shipped first to Lisbon (Portugal) for three years and from there to Egypt with a British expeditionary force under command of Gen. Ralph Abercromby (sometimes 'Abercrombie'). Bonaparte had previously invaded the Middle East (1798-1801), ostensibly to protect French trade interests but, more importantly, to threaten Britain's hold on the sub-continent of India. The British expeditionary force was successful in defeating the French troops on land, notably at the Battle of Alexandria, but it was Nelson's naval victory at The Nile that put an end to French ambitions in the Middle East. 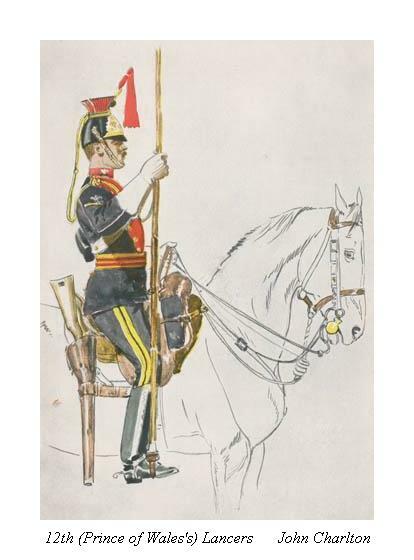 Returning to the (recently declared) United Kingdom in 1802, the Regiment, with an establishment of 485 officers and men, spent two years in Ireland (at Limerick and then Dublin) and then, from 1805 to 1811, they were in Southern England until sent, once again, to the Spanish Peninsular in 1811. Fighting constant minor engagements with the Duke of Wellington in Spain, the Regiment was prominent at Salamanca and Vittoria and they followed Bonaparte's retreating army into France. 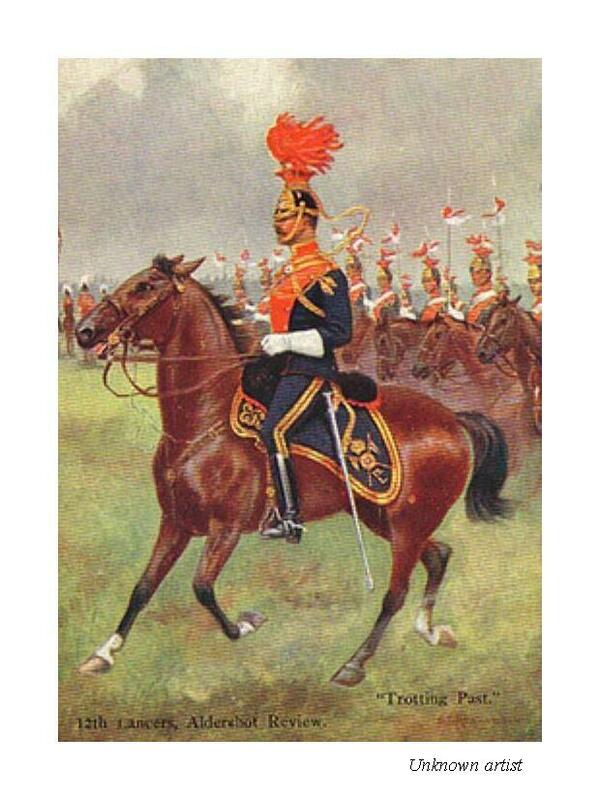 In 1814, the Regiment returned to Hounslow and thence to Dorchester. 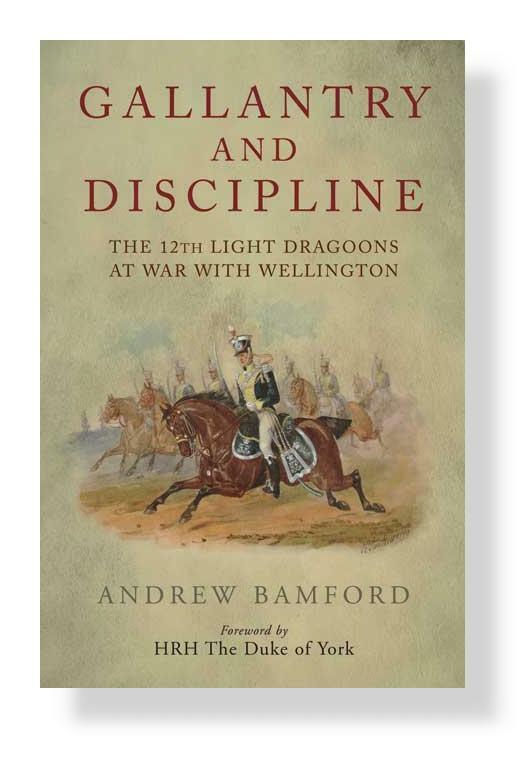 On Bonaparte's resurgence in 1815, the 12th Light Dragoons played a key role at Waterloo by driving off French lancers who were decimating the British heavy cavalry brigade after its stunning charge against the French infantry. 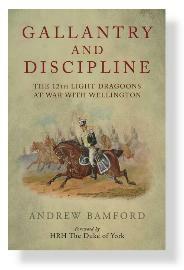 "As the Regiment moved forward, it gradually increased its pace; the men were anxious to charge, but Colonel Ponsonby . . . restrained their ardour, that he might maintain their compact formation and reserve the power of the horses for the critical moment." 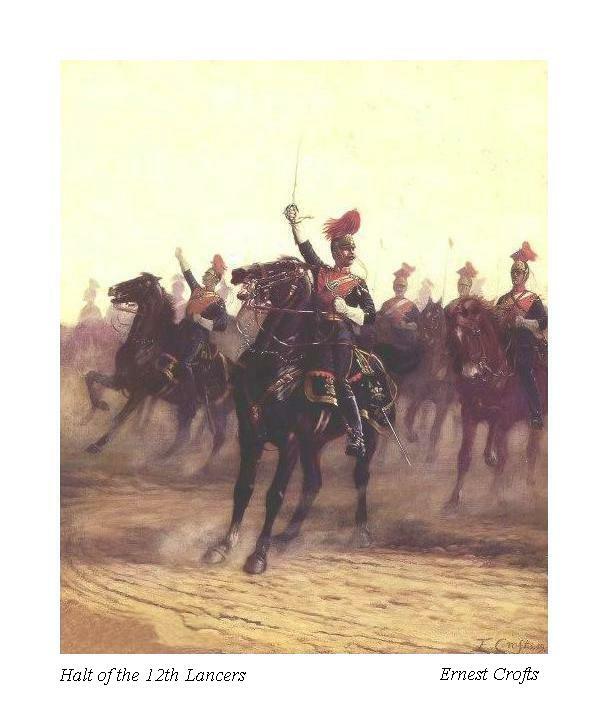 Throughout the day, the Regiment, led by Col. Frederick Ponsonby, engaged with French cavalry which had penetrated beyond the British squares. At Waterloo the Regiment lost 3 officers and 43 other ranks killed, with 28 horses killed and 82 horses wounded or missing. 2 officers (including Col. Ponsonby) and 53 other ranks were wounded, many seriously. 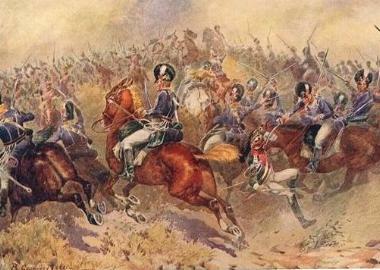 After Waterloo, the Regiment remained in France as part of the army of occupation. 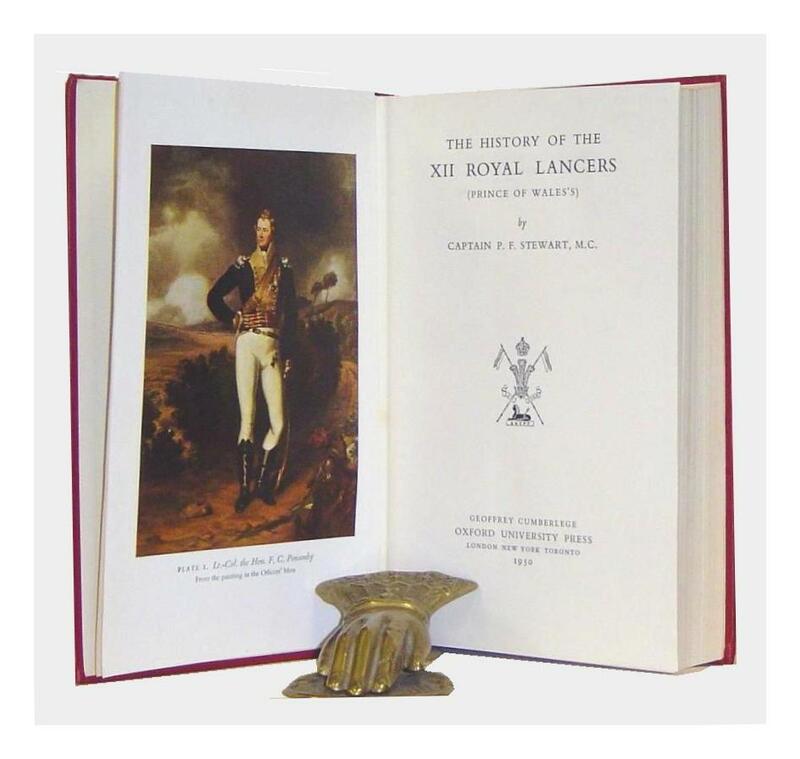 In 1816, Waterloo Medals were presented to the soldiers on the site of Agincourt. 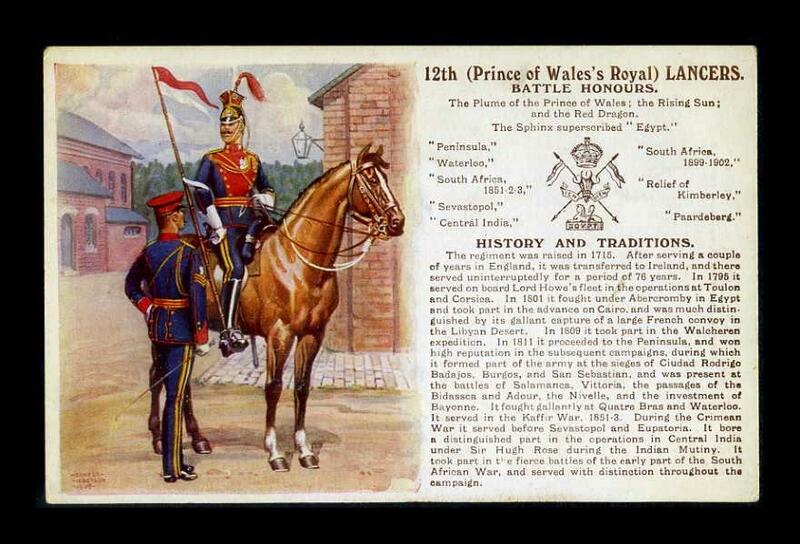 Late in the year, the 12th Light Dragoons returned to England. 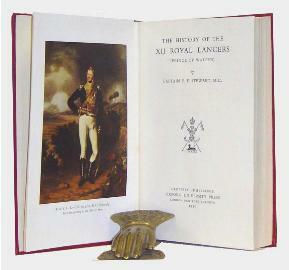 Partly as a consequence of Waterloo, in 1816 a number of British 'light dragoon' regiments, including the 12th, were designated 'lancers' and in March 1817 the Regiment was named the 12th (Prince of Wales's) Royal Lancers at which time the facings of their blue uniforms were changed from pale yellow to scarlet. The Regiment returned to Southern England in 1818, and thence to Ireland in 1820 for four years, returning to England (Brighton) in 1824. When Portugal was threatened by a Spanish invasion in 1826, four troops from the Regiment joined a British force sent to Portugal's aid. Hostilities were avoided, and on returning to England (Canterbury) the Regiment marched to Scotland and thence, once again, to Ireland, where their Colonel, at that time Lt. Gen. Sir Hussey Vivian, was in command of all British forces. 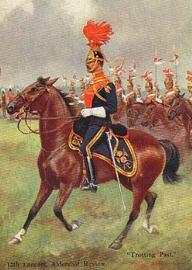 In 1830, the light cavalry's blue jackets were replaced by scarlet jackets. Returning from Ireland in 1834, the Regiment was stationed at Manchester, Birmingham, Dorchester and Coventry within the space of two years. Returning to Hounslow, the Regiment, together with the 1st Life Guards and the Grenadier Guards, was reviewed by the new Queen Victoria, then eighteen years old, and the Regiment formed part of the Guard of Honour at Victoria's coronation in 1838. 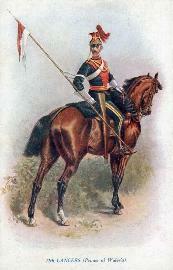 In 1840, the Regiment returned to Ireland. In 1842, the scarlet jackets were, again, changed to blue jackets for all light cavalry regiments. In October 1851, the 12th Lancers arrived in South Africa to join the 8th Xhosa War (1851-53) - the wars in Southern Africa were waged intermittently over one hundred years as local tribes resisted British colonialism. 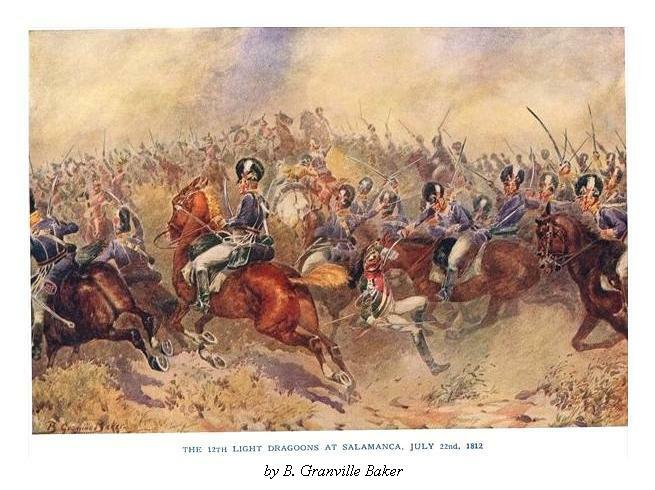 Although sent to the Crimea in 1856 (with an establishment of 610 officers and men), the Regiment were fortunate to avoid Balaclava and the fate of Cardigan's Light Brigade. They fought at the siege of Sebastopol. When Indian troops mutinied in 1857, two squadrons of the Regiment were sent to India. 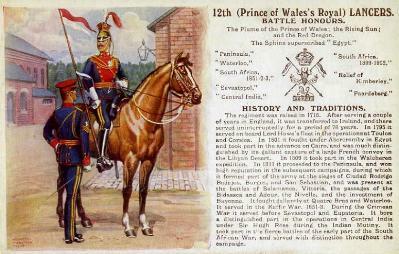 The Regiment shipped to South Africa to fight the Second Boer War (1899-1902).